Who invented the double entry bookkeeping system? The best place to begin a journey into accounting is at the start. Double entry bookkeeping was originally devised by the Italians in the fifteenth century. What are the principles used for in business? The principles of double entry bookkeeping are used for recording financial transactions that occur within a company. Financial information accounts are recorded in the book called a nominal ledger or another term is often used is the general ledger. An account is a page in the ledger. These accounts in the ledger are usually called as T accounts. For example a nominal ledger set up for assets where information about machinery or furniture will be recorded. Other ledgers would be for rent, lighting and heat, sales, purchases etc. Here is an example of a T account that would be recorded in a ledger. What is meaning of the term “double entry” in bookkeeping? The words “double entry” explains that each transaction that occurs within a business, that transaction must be recorded twice. To do this with a ledger account we must split the page in two where on the left it is called a Debit (DR) and on the right it is called a Credit (CR) as above. You might be asking yourself why do I need are there two parts of the accounts? The answer to that is each transaction has two parts. In other words each transaction has a debit and credit to it. Trapattoni Ltd. buys a machine for €1000 cash. Here we have two parts of a transaction. First the company has obtained a machine worth €1000. Also the company has lost cash of €1000. The company records this information in two accounts. The company records an increase in the machinery account and it records a decrease in the cash account. Which account do I debit and which do I credit? The answer is we debit the receiving account and credit the giving account. This is also referred to as the Golden Rule of Accounting. The reason why this rule is so is because that’s what the Italians decided back in the fifteenth century. They for all could have swamped this rule around if they so wished. The company receives a machine for €1000 so it is recorded on the debit side and the company spent €1000 so it is recorded on the credit side. A wonderful question to ask! To answer it there are four types of transactions: Assets, Liabilities, Expenses and Incomes. You must remember your double entry. On the Debit side there will be assets and expenses. This will always be the case. On the Credit side it will be liabilities and incomes. As same as above they will always be credits. The Liabilities and Assets will only appear in the balance sheet and Incomes and Expenses will appear in the income statement. 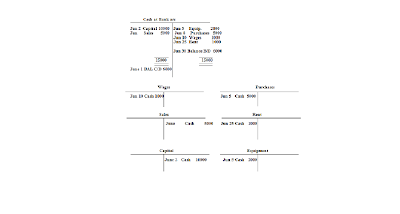 The balance sheet and income statement will be explained later on in your studies. Hmm I think I get it, do you have an example I can examine? Shareholders invest €10,000 into the business on June 2nd. The company purchases €2000 worth of equipment on June 5th. Purchases were made costing €5000 on June 8th. The company pays wages of €1000 on June 10th. Rent of the building comes to €1000 on June 25th. Keano sales for June were €5000. 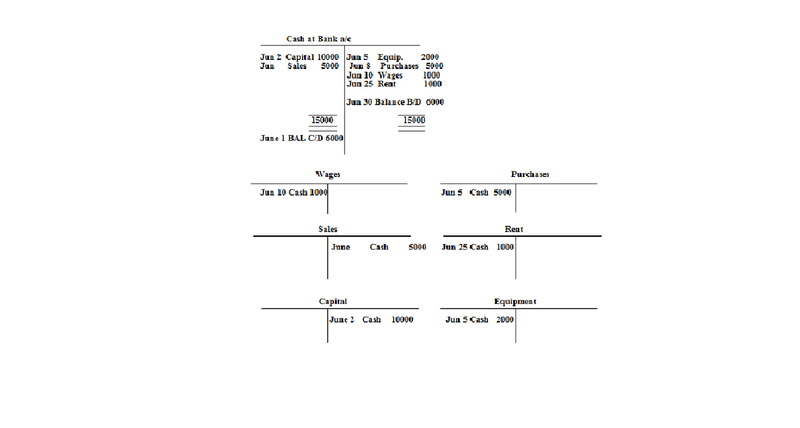 Here we have a nominal ledger which contains several accounts of a firm. As you can see some of the figures of the accounts are on either the left or right side of the T account. As we mentioned before, there are four types of transactions. Can you name them above? We can also see the figures being double entered. Where rent €1000 appears on the debit side of the rent account it appears on the credit side in the cash at bank account. This goes back to what was mentioned earlier, there is two sides to every transaction! As seen in the cash at bank account the company has a debit balance. This means that the company has brought in more money than spent over June. If we had a credit balance it would be a Liability in which the firm would have to get a loan. Why should I learn this double entry bookkeeping, can’t I get a computer to do this? I hear you asking “Why can’t I do this on a computer, would it be faster and easier” It is true a computer can do this but a person has to know how to input the data into the system. This means they must understand where each transaction or a group of transactions should go. If a shareholder of a company asks you the Accountant, “Why did you put machinery in to accounts of the books, should it not be in only one account?” It would make you look very silly and your job in danger if you could not explain to the shareholder the basic concept of double entry! Why should I be an accountant? There are so many reasons to pursue a career in accountancy it can be best summed up with these videos. Thanks for the comment Charles. Always nice to get some feedback.